Propeller Education Kit Labs Fundamentals Text. Propeller Education Kit Labs Fundamentals Example Code. This text is an updated and printed compilation of the Fundamentals labs in the Propeller Education Kit series for the powerful multiprocessing Propeller microcontroller.With its 8 parallel-processsing cogs, the Propeller chip’s unique design makes a variety of otherwise difficult microcontroller applications relatively simple. For example, processors can be assigned to audio inputs and outputs, mouse, keyboard, TV or LCD display to create a microcontroller based computer system, with processors left over to work on more conventional tasks such as monitoring inputs and sensors and controlling outputs and actuators. Although the Propeller chip is very powerful, that doesn’t mean it is difficult to use. The Propeller chip also comes in handy for simple projects involving indicator lights, buttons, sensors, and speakers found in common product designs. 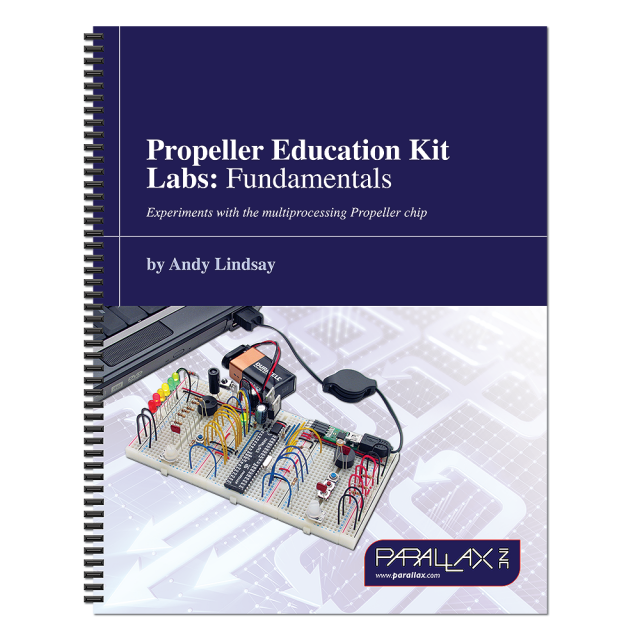 You can build examples of these circuits with the Propeller Education Kit and the labs in this book. Written for college and university electronics, robotics, microcontroller, and senior design courses, this text is also a valuable resource for hobbyists with previous microcontroller experience who want to explore the Propeller chip. Setup and Testing - building your Propeller Platform circuit. I/O and Timing Basics - techniques for controlling outputs, monitoring inputs, and timing events. Methods and Cogs - how to write and call Spin methods and launch cogs. Also covers parameter passing, return values, and setting aside stack space for methods launched into new cogs. Objects - How to build and use them to simplilfy multiprocessing, with focus on variable values, I/O pin states, and measurements with the Parallax Serial Terminal. Counter Modules and Circuit Applications - With counters, any cog can manage two additional processes, simplifying signal monitoring and generation. Example applications include RC decay, infrared object/distance detection, and metal proximity detection. Signals include D/A with duty signals, square waves up to 50+ MHz, and PWM. Dimensions: 9 x 11 in (23 x 28 cm). Spiral binding, 228 pages. Black & white printing.